This week’s snippet is the story of a girl who was orphaned during the Civil War and her quest to find the love she lost as a child. Martha Ellen Rodgers, simply Ellen in the book, grew up in a large, loving family in Mississippi. Her parents died of typhoid within days of each other when Ellen was nine. She spent the rest of her life searching for love and a place to belong. Her travels took her to Alabama, back to Mississippi, and eventually to Texas where she found the love of her life – only to have everything ripped from her in a shattering turn of events. Note: You’re going to need a kleenex for this one. 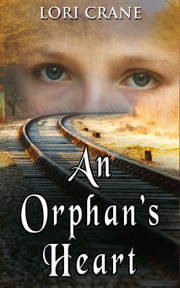 An Orphan’s Heart is being offered for FREE this weekend (Sept 26-28) on Kindle at Amazon. Enjoy the video and snippet below and pick up your FREE copy today. Ellen is staying at her aunt’s house in Alabama and helping with the children. She met a handsome boy named Milton who has unexpectedly dropped by while no one was at home. We make ourselves comfortable at the table, and as we sip our coffee, we chat about his family and farm, but his deep brown eyes make it hard for me to concentrate on anything he’s saying. We chat about his siblings and his hopes for the future. He even mentions that he might like to go to a big city someday, which brings up his desire to ride a train. I would tell him of my dreams of riding a train also, but I can’t seem to get a word in edgewise. Throughout the one-sided conversation, he’s very friendly and open, and I think I may like him a lot more than my first impression, especially his penetrating gaze. Nothing else in the world exists while I’m under that gaze. “I do have to go get the children right now. I only have a few minutes to get there. Please excuse me, Milton. It’s been nice spending the afternoon with you, but I really must hurry.” In one move, I grab my bonnet and head toward the door, hoping he’ll hurry behind me, but he seems to be taking his time. I stand with my back against the open door, ready to close it the moment he exits. As he nears the door, I impatiently wait for him to walk through, but he stops an inch from my face. I think he may kiss me and I feel panic rise in my chest and can’t breathe. I close my eyes for a moment, but then think maybe I shouldn’t because it’ll look like I want him to kiss me, so I quickly open them. His full lips, that cocky grin, and those dimples are enough to set a girl’s head spinning. I’m late to pick up the children, but for that split second with his mouth an inch from mine, I really would like him to kiss me. But then I get this uncomfortable feeling that spending this afternoon with him has been highly inappropriate, so I sidestep away from him and move outside onto the porch. He steps out onto the porch, with his head cocked to one side, looking at me through squinted eyes. The afternoon sun in his face shows the slightest beginnings of lines around his eyes, and I think as he ages, he’ll become more and more handsome. He shrugs and his smile widens. His smile is filled with a knowledge and confidence that’s alluring, but it also unnerves me in a way I can’t explain. I wish I was more attractive, more assured of myself, more experienced with boys. I slide behind him, pull the door closed, then quickly move around him again to step off the porch. He watches me with the look of a lion stalking his prey as I climb onto the wagon. “The visit was my pleasure, Miss Ellen, my pleasure,” he says as he strolls over and places his hands on the worn wood of the wagon. “I really do have to go now. Please come by again anytime,” I mumble. Did I really just say that? Did I just invite him over again? “Oh, I’ll be back. You can count on that.” He winks and his eyes twinkle. I snap the reins and coax the horse away from the house. I take off so fast, I almost rip Milton’s hands off, but I refuse to look back and check. I know he’s standing there watching me. I will not look back. I will not. No. As I reach the bend in the road, I glance back. Sure enough, he is still standing in the yard with his arms folded across his chest, watching me and smiling. And now he knows I looked back. Oh, what a mess.